To Cite: Ambey R, CD V. Bone Marrow Aplasia: a Rare Complication of Disseminated Tuberculosis, Arch Clin Infect Dis. 2012 ; 7(2):e13949. doi: 10.5812/archcid.13949. We report 11 year old male child, a case of acquired aplastic anemia as a complication of disseminated tuberculosis with acute onset, rapid downhill course and refractory to both antitubercular drugs as well as immunosuppressive drugs. Copyright © 2012, Infectious Diseases and Tropical Medicine Research Center. This is an open-access article distributed under the terms of the Creative Commons Attribution-NonCommercial 4.0 International License (http://creativecommons.org/licenses/by-nc/4.0/) which permits copy and redistribute the material just in noncommercial usages, provided the original work is properly cited. We would like to share our experience with an eleven-year-old male, a case of acquired aplastic anemia as a complication of disseminated tuberculosis with acute onset, rapid downhill course, and refractory to both anti-tubercular as well as immunosuppressive drugs. Tuberculosis is known to cause wide variety of systemic complications when it disseminates in the body. Tuberculosis, suppressing all three cell lines which causes pancytopenia, leading to aplastic anemia has been reported by very few case reports, either as the result of disseminated tuberculosis or as an adverse effect of anti-tubercular medicines (1-3). An eleven-year-old male, weighing 27 kg with poor nutritional status presented to our pediatric intensive care unit with history of fever for one month, headache and vomiting for 15 days and weakness of right half of his body with right-sided deviation of the angle of his mouth for 3 days. He also noticed bluish spots on the chest and trunk for one day. He lived in an overcrowded house with illiterate parents and belonged to a family with low socioeconomic status, but was immunized and had BCG scar with a history of contact with an active tuberculosis patient in his family. He did not have similar complaints in the past or any hospitalization or medication. On examination, the child was afebrile and normotensive, his heart rate was 110 beats per minute, and respiratory rate was 27/min. He was severely pale, and petechiae were observed over the trunk accompanied by subconjunctival hemorrhage. He was drowsy with altered sensorium. Neurological examination revealed meningoencephelitis with right sided hemiparesis with left sided facial palsy. The examination of other systems was within normal limits. Cerebrospinal fluid analysis revealed 432 mg/dL protein, 43 mg/dL glucose, 110 meq/L chloride with 160 cells out of which 75% was lymphocytes and 25% was polymorphs. Gram staining of the CSF was unremarkable and culture was negative. However, CSF PCR was positive for mycobacteria tuberculosis. There were few signs of raised intracranial pressure without active seizure. He was given supportive treatment with intravenous fluids, mannitol, and dexamethasone. When he was stabilized on the second day, antitubercular therapy and nasogastric tube feeding were initiated. 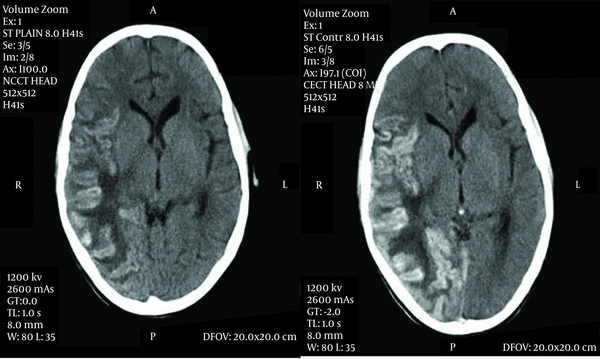 Brain CT showed gyral swelling with patchy hemorrhage involving fronto-parieto-temporo-occipital lobe (meningo-encephelitis) with grade 3 perifocal edema leading to mild leftward midline shift (Figure. 1). Hematological deterioration continued as pancytopenia was persistent on peripheral blood smear examination. Peripheral smear did not show any abnormal cells, hemoparasites, or evidence of hemolysis. Bone marrow aspiration confirmed hypoplastic marrow with epitheloid cell granuloma and focal necrosis consistent with tuberculosis. There were no features suggestive of hemophagocytic syndrome in bone marrow smear examination. The bleeding time was 14 minutes. The clotting, prothrornbin and partial thromboplastin time were normal. The urine and stool examination did not show any abnormality. Urine and blood cultures did not grow any organisms. The direct and indirect Coomb's tests were negative. Blood Widal, HIV ELISA and VDRL were non-reactive. We added anabolic steroids and later cyclosporine for which there was no response. There was no possibility to transfer the patient to another center with facilities for bone marrow transplantation. In spite of two platelet-rich plasma transfusions, the child started bleeding due to severe thrombocytopenia, developed hypovolumic shock and died as the result of massive uncontrollable upper gastrointestinal and pulmonary hemorrhages after 19 days of hospital stay. Autopsy could not be performed. Literature shows the occurrence of pancytopenia in disseminated tuberculosis is attributed to hypersplenism, histiocytic hyperplasia and indiscriminate phagocytosis of blood cells by histiocytes in the bone marrow, maturational arrest, or infiltration of the bone marrow by caseating or noncaseating tubercular granulomas. Tubercular granulomas may cause pancytopenia by replacement of marrow cells or suppression through release of interferon and lymphotoxin. However, despite presence of tuberculous granulomas in a high proportion of patients with disseminated tuberculosis, pancytopenia is uncommon (1). Pathophysiology of acquired aplastic anemia in tuberculosis is found to be immune-mediated based on observation of recovery after immunosuppressant, but the present case was resistant to this treatment (4). There are several unusual features of interest in this case. Amidst many reports which have not shown association between tuberculosis and aplastic anemia, our case brings back the old view to support the causation of aplastic anemia in tuberculosis (5). Aplasia of the bone marrow was caused by an overwhelming toxemia. Surprisingly no system was able to analyze the effect of the condition on bone marrow, disregarding the neurological aspects. In spite of limiting to two foci, severity of the bone marrow disease was rapidly progressive and did not respond to supportive treatment. I acknowledge Dr Ajay Gaur, Head of the Department and Dr GS Patel, Dean for motivating and supporting us to publish the case report. Implication for health policy/practice/research/medical education: Tuberculosis is known to cause wide variety of systemic manifestations when it disseminate to the body. We are reporting a case of bone marrow aplasia in a child due to disseminated tuberculosis. The case emphasizes that Tuberculosis continues to be a Pandora’s Box with many new surprises for clinicians. Authors’ Contribution: Veerbhadra CD collected the clinical data and prepared the manuscript. Ravi Ambey reviewed the literature, revised the manuscript and is guarantor. Financial Disclosure: We declare that we have no financial interest related to material in manuscript. Funding/Support: The study did not receive any fund.